(From Sigma lens literature) The Sigma Corporation is pleased to announce the launch of the new APO 150-500mm F5-6.3 DG OS HSM. An ultra-telephoto zoom lens covering a telephoto range up to 500mm, incorporating Sigma's original OS (Optical Stabilizer) function. Incorporating Sigma's original OS (Optical Stabilizer) function. An ultra-telephoto zoom lens covers a telephoto range up to 500mm and allows short perspective. HSM ensures quiet and high-speed autofocus. This ultra-telephoto zoom lens covers a telephoto range up to 500mm and allows photographers to bring the subject close and short perspective. Sigma's original OS (Optical Stabilizer) function offers the use of shutter speeds approximately 4 stops slower. It is ideal for sports, wildlife and landscape photography with handheld shooting. Three SLD (Special Low Dispersion) glass elements provide excellent correction for chromatic aberration. This lens is equipped with a rear focus system that minimizes fluctuation of aberration caused by focusing. The super multi-layer lens coating reduces flare and ghosting. High image quality is assured throughout the entire zoom range. This lens incorporates HSM (Hyper Sonic Motor), which ensures a quiet and high-speed AF as well as full-time manual focusing capability. The addition of the (optional) 1.4x EX DG APO or 2x EX DG APO Tele Converters produce a 210-700mm F7-9 MF ultra-telephoto zoom lens or a 300-1000mm F10-13 MF ultra-telephoto zoom lens respectively. A removable tripod socket (TS-31) is included as a standard component. Some may find it "plasticy", but the use of plastic keeps it both lighter and less expensive. MF only with a TC. This is the third Sigma 500mm zoom that I've owned. The first was their non-OS 50-500mm, and then their 50-500mm OS and finally the 150-500mm OS. I use the 150-500mm on Nikons, including a D3, D700, D7100, D300 and D2X. At 5-6.3 it isn't the fastest 500mm zoom on the planet, but considering the cost and performance, it's definitely a bargain. I paid $799 for a refurbished, like-new model from Sigma in New York. I use it for action sports shooting, almost all of it outdoors during daylight hours, including yacht racing, and occasionally for large artificially-lighted stadium events, such as baseball and Super-cross motorcycle racing. Shooting in such light is not a problem with the higher ISO capabilities of the D3, D700 and D7100. The exterior finish of the 150-500, being mostly plastic instead of painted metal, holds up very well. It still looks brand-new, after a year of salt-water spray, dust and dirt. Functionally, the Sigma HSM AF motor is smooth, quick and dead-silent, even when used on non-internal lens drive Nikons such as the D5300. The long tripod/monopod mount, with finger-indents, makes it very easy to carry even with a heavy D3 attached. As with any lens with this range, you can only use MF with a TC, but that's a minor issue. Though no lightweight, it's not as heavy as you might expect, weighing 62.8 oz, much less than Sigma's 120-300 2.8 lens, which weighs 104 oz. Shooting hand-held is not a problem, for me anyway, and the OS makes it even easier. I shot my non-OS Sigma 50-500 hand-held most of the time, and at any speed of 125s and above, at 500mm, I could get sharp images. The weight of both lenses is similar, as is the tripod handle shape and location, which is a big help when hand-holding. As others have mentioned, f8 seems to be the sweet-spot for sharpness, though I haven't noticed any marked sharpness drop-off at any aperture. All things considered, it's my favorite lens for sports shooting. With a minimum focus distance of 86.6 inches, and a 500mm reach (about 750mm on a DX body), it's got all the coverage I usually need. I would definitely recommend it, and I'd buy it again. Please note: Sigma has discontinued this lens, though it appears to still be available at the Sigma website, both new and refurbished. If you need a zoom that goes to 500 mm, this lens is a real bargin. It is better and cost less than the Tamron 200-500. The new Tamron 150-600 will give this lens a good run for the money, but it is still cost about $200 more. The AF is fast enough for birds in flight, at least most of the time. Sharpness is excellent up to 400 mm, beyond that it start to get a bit soft, but still very good. If light is low or if you need really fast shutter times, the small aperture will be a weaknes. I use my lens with a 77 mm step-down ring when I need filters. No sign of vignetting. The lense produces almost actual color, fast and accurate AF and more importantly for the focal length is useful OS. The lense's sweet spot is at F8. I have taken birth and animal photos and I am delighted with the result. To view some of fabulous shots, please click the link below. I got the 120-400 first, a lens that doesn't impress anyone at 400mm, but the 150-500 does perform a bit better, not least at longer focal lengths than the 120-400 (which is best at 120-150). The 150-500 is slightly bigger and heavier than the 120-400, but cheaper. Used on my Pentax DSLRs I can either use the OIS, ot the cameras's SR - got a gut feeling the OIS is somewhat better :-)! But on the whole, nice lens, but not spectaular! Non given that one knows the maximum aperture etc when one buys it. I shoot this equally on a D300S and D7000, favouring the D7000 in low light conditions. I think the user should consider the following before buying, not only this lens, but anything in this focal length, especailly on a non-FX sized sensor. How good is your technique hand held ? If you currently struggle with a 200 or 300mm then think again unless you happy to lug about and set up a tripod for each shot, factor this by at what ISO your camera body will produce acceptable output. I have just won a local competition with an image grabbed at 500mm on my D7000 handheld. Lenses like this often get a bad rep from folks who unfortunately just cannot leverage them. I do not believe the USD to GBP conversion rate used by the gadet was anything near what is was when I acquired my copy so the USD value is over stated. I paid 770 GBP. I plan to acquire a Nikon 300mm 2.8 (and converter) but I see that as complementary to this lens as I certainly would not "walk around" with that set-up. I must confess that given the price differential and performance of this lens that I do not understand why anyone would go the 50-500 route. I bought this lens for use with my Nikon D80 for wildlife/nature photography after reading the reviews on SLR Gear and other sites on this lense and on the Nikon 80 - 400 VR. Compared to the Nikon the Sigma appeared to offer faster focussing speed, an equally effective optical stabiliser, longer reach (the extra 100mm was important) and adequate build quality for my purposes. Also against the Nikon 80 - 400VR was its age. It is generally considered to be overdue for an update, and I didn't want to buy one then find it superseded by an improved version in the near future! To guard against possible durability problems with the Sigma, I bought an extended Mack warranty. The lense has performed fully to my expectations. Handheld, it provides sharp, richly coloured images. It did take some time to develop a technique for carrying and handholding the lense/camera combination, which weighs 2.7 kg all up. Following the advice of SLR Gear reviewers it is used mainly at f8 and with as high a shutter speed as I can obtain and still keep the ISO sensitivity reasonably low. I've also used it with a Sigma 1.4X teleconverter, and although focussing becomes super critical, with perseverance it provides stunning images. As one SLR Gear reviewer noted, the Sigma produces sunstars, particularly when photographing reflections from water, however I find this an attractive feature. Cons: In tests of the lense carried out on a tripod and with the lense set at various apertures, it appeared that focussing on my D80 body varied slightly from shot to shot. This may be more a characteristic of the camera's autofocus mechanism than any problem with the Sigma. When the focus was accurate, however, the images produced were very sharp. On a camera with live view and the ability to magnify the image and achieve fine focus, I would expect consistently sharp images. Conclusion: An excellent lense and very good value for money. This is a qualified yes - read on to see why. I traded this lens with another photographer in exchange for my excellent Sigma 150mm Macro - is a shame to give this lens a negative review as it is a "try hard" attempt but there is no getting away from the issues. my main problem is that is it almost impossible to focus on a moving object at 500mm....the point at which most people will want to use it. Having an FX full frame means I really want good performance at 500mm to make up for the lack of a DX crop factor. The fact is that it though that it performs worse than my nikkor 80-200 with a Tamron x2 on it, both in image quality and focus speed and most people are well aware that teleconverters do little for image quality and focus speed. Yes it DOES focus at F6.3 and 500mm and yes it will focus on a moving object but only until it gets to about 25-20 metres but after this it gives up every time. initial trials shooting Gannets in New Zealand were very disapointing and a Nikkor 80-200 on a d300 (even with a TC) just blow it away, although I will concede that the lens does seem to perform reasonably well from 150-300. My main issue besides focus speed is that the image quality on shots taken at 1/1600 are poor even when the camera autofocus has locked on. This contrasts with test images shot with MLU on a tripod which seem to lack nothing. The conclusion here is that either handholding this lens is a waste of time even with OS, or, that the lens never quite catches up with what the auotofocus is asking it. To make the point, I can get sharp shots indoors handholding at 1/50--1/100th @ 400mm but its a world of differenece in the field trying to keep the target in focus even with the otherwise fantastic 3D tracking on my d700/mbd10. Despte the impressive looking shots on show with other reviewers there is the world of difference in showing on a monitor at 72DPI and a full clour print, so let me also say that my main criterion is that I expect to be able to print my images at A3 or A3+ and feel satisfied as a potential purchaser. So conclusions are that if you dont need fast reliable autofocus on moving subjects this lens might well ring your bell. Otherwise be prepared to be disapointed. I think this supports my view that IQ is very dependent on the speed of focus: give it a chance to really lock on and when the subject doesnt move much, and at less than max zoom its capable of good results. Always I'm looking for a supertele. I'm a Nikon gay, new in photo and looking to this wonderful Nikkor lenses make many wishes about, but the price make me forget it. 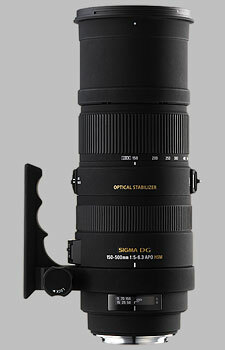 This Sigma 150-500 OS was a big oportunity for me and I buy it. I'm very happy with, from about one year. I don't want to tolk about specifications data and laboratory testing. Is many reviews very good and precisely. When read specialist reviews you can see the lens have CA but is not anusual. The lens have flare, but I like it very much. The lens is not sharp enough in the corners, but I don't need that. I use it for outdoor sport. For mini football is perfect in the far fase, about 30 m. For nearly fase is not wide enough. For nearly fases it must to use the second lens, with the second camera too. For nearly I use Nikkor 18-200 VR. Here I think 50-500 is perfect, bat have not OS for handhold. I was angry last month when Sigma anounce 50-500 OS but I must ignore it because is double the price of my 150-500 OS. But I'm sure this 50-500 OS is perfect for all the fases in sport, nearly and far. I use Sigma 150-500 OS in birding shot and is very good for flying bird. Very good OS in panning in motor sport auto and cycling too. But I'm very satisfied when I go to shot people portrets in public places like garden, park. The people walk arround and don't know her faces are in my camera. Well here is a problem with lens dimensins. Is not very discret but it work. The big issue with, is 150-500 OS create dependence. I have not many lenses but my favorite was nikkor 18-200 VR everytime. The dimendions, sharp, AF speed, versatility from macro to sport and street is perfect. But after use one day Sigma 150-500 OS, I can't retorne to Nikkor 18-200 VR. Is to short. In conclusion is a very good supertele lens at a afordable price. I recomad it with all my heart. Sometimes I need more than 300mm. Wanted to wait for a new Nikon telezoom but needed something now. SLR Gear didn't have any test results to help my decision, but I bought one anyway. The Sigma is better than I thought. From 170-400mm the images are good. Around 200-350 is its sweet spot. Best shots are f8. BUT I have good results wide open in the lower range, and at 500mm f8 the images are acceptable. Biggest issues are: chromic abberations and flare. The CA are correctable in most shots, but the lens seems to lack good coatings on the inner elements so there is some flare and glare. Color richness is better with my Nikkors but in post processing increasing saturation helps the Sigma. At f22 there is a strong starburst when shooting point light sources. The lens is handy... it goes in my backpack. The image stabilization is very good, after it locks on. It takes a bit longer than most other lenses but allows handheld shots at 500mm. The trick is to get the lens started about a second before you want to take the shot. It's also good when tracking moving subjects. It's a bit noisey but acceptable. Overall, I'm happy the Sigma has found a home in my camera pack. It's not a professional quality lens but if you can use a 1-off lens, then the Sigma is your best bet. I got this lens as a smaller, easier to carry 'long' lens (as an alternate to my Nikon 200-400). Gave up waiting for an AF-S version of the 80-400. This lens gave me my money's worth and does what I wanted it to do. I use it on my last two trips - Montana and Colorado. Was a good lens for wildlife - on trails and in the car. I left this lens on a second body - and grabbed it off the rear seat when needed. Can't do THAT with the 200-400 or larger prime lens. I wish Sigma had put another $500 or so into this lens - upping the IQ or making it a little faster but it fills a niche where there's little competition. A woman using a 170-500 was blown away when I lent her this lens. The OS works and gave me better images hand held than she got on a tripod. I ended up with a Nikon 80-400 and did some comparisons. Wide open at 400mm the Sigma matched or beat the Nikon in sharpness - though the balance tips as you step down. IMO, this lens is a better value than the current version of the Nikon 80-400. Longer reach, faster AF and 2/3 the price. Note - You'll want a manual focusing screen if you try using TC's on this - and you will lose IQ. Have shot with both the 1.4 and 2.0 using a Katzeye screen. All in all I've been pleasantly surprised by this lens. Does it match my 200-400? No, but it cost 1/5 the amount and gives me 4/5 the result in a smaller, lighter package. It's easier to carry backcountry, to get through airports and I'm less paranoid about it as well. From other reviews, it DOES seem as if there were some early problems and there are sample variations so make sure you can exchange if you have problems. I bought this lens for a trip to Svalbard. 2. Nikon 80-400VR had bad reputation for being slow focusing and are starting to get rather old now. 3. Sigma 80-400OS is also outdated (and now also discontinued) + sharing the Nikon reputation of slow focusing but still a bit faster than the Nikon. Look and feel is just the same as the EX series lenses from Sigma. A new "Nikon style" lens cap has been developed and is now much better than the old Sigma caps. OS function rely works and make it possible to shoot at about the same shutter speeds that would have been possible with a non OS lens and a monopod. Image quality and sharpness is good as long as you don,t expect prime lens performance. I feel that handheld or on a monopod the OS funktion and this lens would outperform many optical sharper lenses in the regards of actual catched sharpness in most cases and for most people. Have used the lens for some wildlife and sports photography. Been using lens on canon mark III and the results are very good. Was able to compare pictures with a canon 500 f4 used on the same wildlife outing and found the images to be comparable in sharpness and tone but a bit off in color compared to canon. It is much lighter and portable than the canon and has the advantage of zoom. I am happy with it and would buy it again. I enjoy wildlife and sports photography but have never considered spending all the money it would take to get the canon lense. This one is great and i think you would have to do some very close scrutiny to tell the difference in the photograph produced. Even though it is smaller than the canon lense, it is still the biggest lense i have by far. It is heavy and will take some getting used to. I am able to shoot very clear photos at 500 with a shutter speed of 200 and perhaps even slower. I took some sample photos to compare image quality with my canon 135l and 70-300 4-5.6. You just cant compare with the 135 but it appeared better than the 70-300 at comparable ranges.